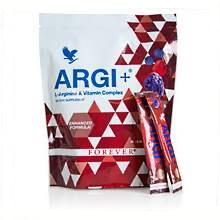 Forever ARGI+ Stick Pack is available with enhanced formula in a convenient stick pack. The stick packs are perfect for on the go, they are easy to dispense in your water bottles and to use wherever and whenever needed. Helps provide a performance boost to every part of you. Arginine boosts nitric oxide production. Proprietary fruit blend adds antioxidant power. Forever ARGI+ Stick Pack enhanced formula provides all the power of L-Arginine plus higher levels of Vitamin D, Vitamin C, Vitamin B6 and Vitamin B12 than the Forever ARGI+. Additionally it contains vitamins Folate, Thiamine, Niacin, Pantothenic Acid, Biotin and Riboflavin. Vitamin D . Research continues to show the benefits of vitamin D for immune, cardiovascular, skeletal, cognitive, and even weight support. A full complement of B vitamins for their role in metabolism and because they are readily depleted by stress and exercise. Pomegranate . Well-known for its strong antioxidant properties. Grape skin , Red grape and Berry extracts for cardiovascular and immune system support. Together, these ingredients create a new generation of supplement, one that supports health throughout your entire body. Add optimal health to your family’s diet with the power of Forever ARGI+ Stick Pack. Mix the content of one stick of Forever ARGI+ Stick Pack Enhanced Formula well with 8 fl. oz. (240 ml) of natural spring water or your favorite Aloe Vera drink or other beverage once daily. Consult your doctor before using if you are pregnant, nursing, or have a medical condition. Read outer pouch before use. This unit is not labeled for individual sale. Keep out of reach of children.